Spines are of variable shape and length, occasionally they are 2.5 cm long. Origin and Habitat: Mexico (Hidalgo). Between Pachuca and Ixmiquilpan and adjacent areas. 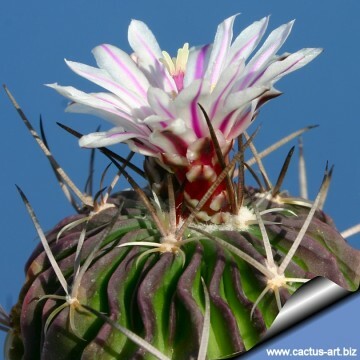 Description: Echinofossulocactus (Stenocactus) anfractuosus is a synonym of Stenocactus crispatus. The plant found in cultivation are quite variable, and the dissimilarity among seedlings spination may be considerable. Habit: It is a perennial stem succulent growing solitary (or rarely branching from the base). Stem: Vimple, somewhat longer than broad, 12.5 cm long, 6 cm in diameter, dull green. Ribs: Approximately 30, thin, compressed, wavy, each bearing only a few areoles. Spines. Somewhat curved, straw-colored with brown tips. Radial spines: 7, the lowermost 4 weaker and smaller, the uppermost 3 (or 2) to 3 cm long, much larger, round or (the central) flattened. Central spines: Solitary, about 2,5 cm long, light brown. Flowers: The perianth-segments purple with white margins. 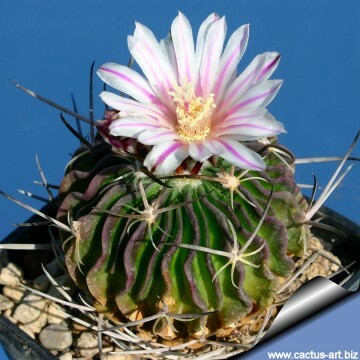 Remarks: Identifying the species of an Echinofossulocactus is as difficult as identifying the genus is easy. For the most part, they tend to look alike, and there are far more names than there are species. 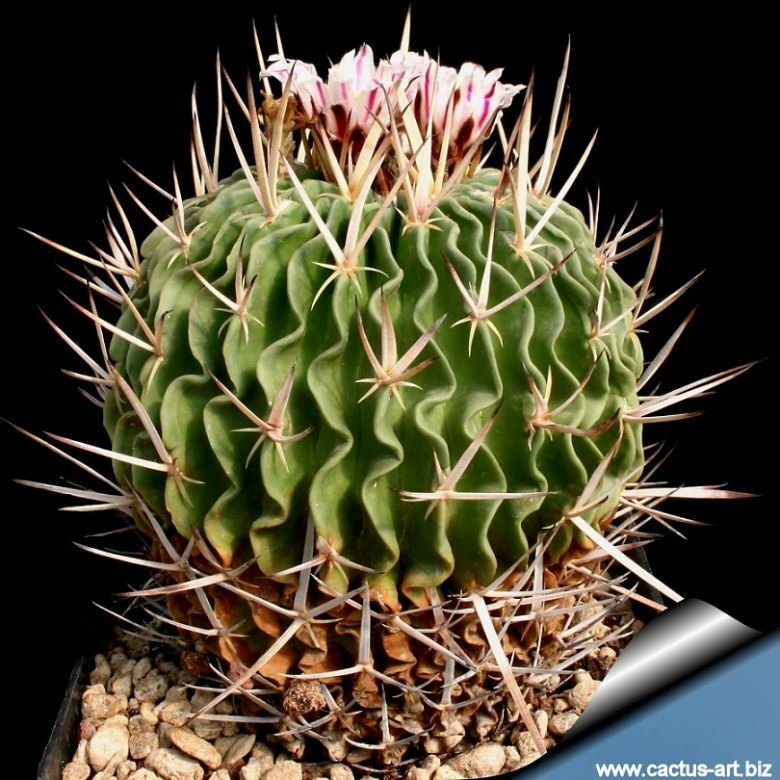 Stenocactus anfractuosus (Mart. ex Pfeiff.) 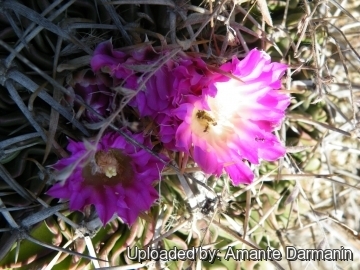 A.Berger: ( Stenocactus crispatus ? ) The plant found in cultivation are quite variable, and the dissimilarity among seedlings spination may be considerable. Stenocactus arrigens f. cristatus hort. : Crested form. Stenocactus crispatus (DC.) A.Berger: It is a solitary plant closely covered with long spines and wavy ribs. This is a very variable species that now includes many form (previously considered independent species) with one form intergrading into another, creating a taxonomig nightmare. Stenocactus crispatus f. cristatus hort. : crested form. Stenocactus fasciculatus hort. : Branched (or solitary) plant, up to 20 cm tall, 10 cm wide with long spines and wavy ribs. Cultivated form. 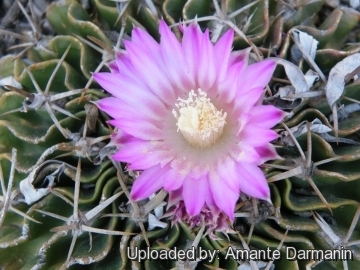 Stenocactus gladiatus (Link & Otto) A.Berger ex Backeb. & F.M.Knuth: This plant is characterized by large, wide and flat sword-shaped central spines. Stenocactus grandicornis (Lem.) A.Berger ex Backeb. & F.M.Knuth: has very long flattened central spines. Stenocactus guerraianus (Backeb.) nov. comb. ined. : Globular, to 20 cm broad, dark-green with woolly apex. Spine are flattened, ferocious-looking with one very long milk-white central spine directed upwards. Stenocactus guerraianus f. cristatus: The crested form deviate considerably from the typical form for having thinner and densely packaged spines, however the overall appearance depend on clones. Stenocactus hastatus (Hopffer ex K.Schum.) 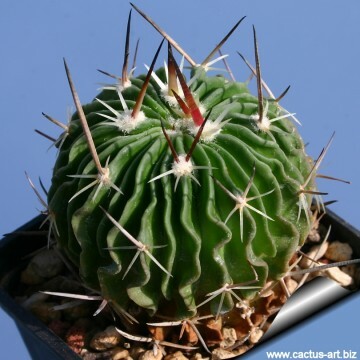 A.Berger: Solitary cactus with long rigid and sharp spines. The plants in cultivation are quite variable. Stenocactus kellerianus hort. : The upper spine spines are long flat and straight. Stenocactus lamellosus (A.Dietr.) A.Berger: Solitary plant crowded with long spines and many wavy ribs. Stenocactus longispinus hort. : has very long spines. Cultivated form. Stenocactus violaciflorus (Quehl) A.Berger: Up to 20 cm tall, 10 cm wide with very long spines and wavy ribs. The ribs are thin with very undulated or curled ridges. Flowers pink-violet. Stenocactus xiphacanthus (Miq.) hort., nov. comb. ined. 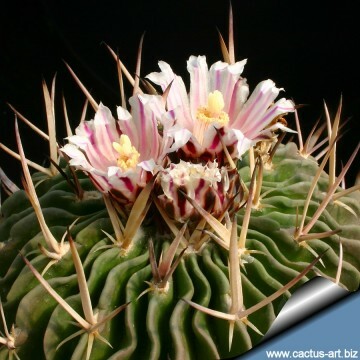 : ( Stenocactus crispatus ? ) "xiphacanthus" is an unclear name applied to variuos Stenocactus in cultivation. This plants are characterized by flattened (Sword-shaped), ferocious-looking spines with one long central spine directed upwards. 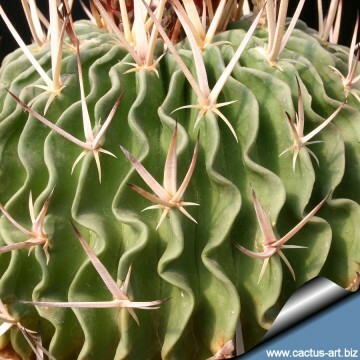 Cultivation and Propagation: Stenocactus kellerianus is easy to to care cactus, recommended for any collection that needs lots of light with ample airflow. Growth rate: It is small growing and easy to to care and very willing to flower. Because of it’s small size makes a great potted plant specimen, great for beginning collectors. Soils: It needs regular cacti soil with little organic matter (peat, humus). Good drainage is essential along with good moisture retention properties and adequate nutrients availability. Repotting: Repotting every other year. As it is especially prone to rot under-pot in a smaller container filled with very porous compost. Use pot with good drainage. Watering: No absolute schedule can be given for watering as various factors (Soil mixture, containers, drainage, temperature, size of plant) influence water use, so - as a general rule - the soil should be thoroughly wetted at each watering during the active growing season (spring and summer), water when the top 1,5- 2 cm of soil feels dry to the finger. Do not soak the soil during the dormant period. Be careful, excessive watering can make root and/or stem to rots. Make sure there is good air circulation between plants. Care must be taken with watering as they tends to become swollen and untidy in growth habit if given too much water and shade. Hardiness: Reputedly sensitive to frost , but less so if kept on the dry side prior to, and during, cold weather (hardy to -5° C for short periods). However some warmth throughout the year will increase the grower's success (minimum 5° C during rest season). These cool temperatures develop sturdier plants and encourage the formation of flower buds. Exposition: Outside bright sun it likes strong sunshine, but is tolerant and do well with light shade during the hot Summer months, inside it needs bright light, and some direct sun. Subject to sunburn if exposed to direct sun for too long. Tends to bronze in strong light, which encourages flowering and heavy wool and spine production. Propagation: Seeds (usually) or by the shoots of adult plants (if available). Seeds germinate in 7-14 days at 21-27° C in spring, remove the glass cover gradually as the plants develops and keep ventilated, no full sun for young plants! The seedlings should not be disturbed until they are well rooted, after which they can be planted separately in small pots. Cuttings of healthy shoots can be taken in the spring and summer. Cut the stem with a sharp, sterile knife, leave the cutting in a warm, dry place for a week or weeks (depending on how thick the cutting is). This permits the cut surface to heal, or callus. The callus helps prevent rotting when the cutting is placed in the rooting material. Once the callus forms, the cutting may be inserted in a container filled with firmed cactus potting mix topped with a surface layer of coarse grit. They should be placed in the coarse grit only; this prevents the cut end from becoming too wet and allows the roots to penetrate the rich compost underneath. The cuttings should root in 2 to 6 weeks.